PREVENTS DATA THEFT – keep your contactless cards safe from ‘digital skimming’ with Swiftons RFID Blocking Money Belt. A protective lining shields your data against thieves who can skim your contactless card, clone it and help themselves to your money. A nightmare at home, a complete disaster abroad. With your cards and cash stored inside Swiftons Money Belt you can ride crowded trains and buses without worrying that you’re unknowingly being digitally skimmed. QUALITY TO DEPEND ON – made from strong, durable 70D Nylon, which won’t fray or put your valuables at risk. Strong stitching keeps contents inside your money belt. Quality durable zips, tested and built for years of use. Smooth action zips with pull cords to quickly and discreetly access contents. ONE SIZE – elasticated belt for waist sizes 26 to 40+ inches. Suitable for Men, Women and Kids. Two compartments for storing passport, cards, cash and more. The larger compartment is 26 x 13 cm and contains three sections for storing cards. The smaller compartment is 17 x 7.5 cm and is suitable for keys, change, and other smaller items. ALL DAY COMFORT – a layer of mesh at the back of the money belt creates a space for air circulation, helping to reduce sweat and keep you comfortable. A super-skinny two-pronged buckle clips so strongly and securely that your money belt will stay on your waist, leaving you confident to enjoy your travels. BUY NOW WITH CONFIDENCE – Give your valuables proper protection. A sub-par money belt is like storing diamonds in a matchbox; it is illogical & risky. Buy protection & peace of mind. This product is Fulfilled by Amazon, so you know you’ll get it in the usual fast way. To buy yours click the orange Add to Cart button. Don’t miss out, Multibuy Discounts are Available for this product. 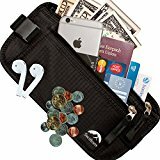 Swiftons RFID Blocking Money Belt – All day comfort for secure protection against digital skimming and pickpocketing PREVENTS DATA THEFT – keep your contactless cards safe from ‘digital skimming’ with Swiftons RFID Blocking Money Belt. A protective lining shields your data against thieves who can skim your contactless card, clone it and help themselves to your money. A nightmare at home, a complete disaster abroad. With your cards and cash stored inside Swiftons Money Belt you can ride crowded trains and buses without worrying that you’re unknowingly being digitally skimmed. BUY NOW WITH CONFIDENCE – Give your valuables proper protection. A sub-par money belt is like storing diamonds in a matchbox; it is illogical and risky. Buy protection & peace of mind. This product is Fulfilled by Amazon, so you know you’ll get it in the usual fast way. To buy yours click the orange Add to Cart button. Don’t miss out, Multibuy Discounts are Available for this product.